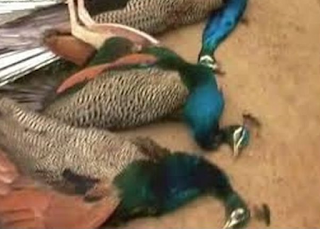 Morena (Madhya Pradesh) : Atleast 21 peacocks died of water scarcity in Sumawali forest area of Joura town in Madhya Pradesh's Morena district. The forest department rushed to the spot and sent the bodies for postmortem. Confirming the report, Sub Divisional Magistrate Pradeep Singh said, the officials are investigating the matter and assured that the damaged hand pumps would be immediately repaired. The matter was reported when people from Hatupura village of the town found the dead peacocks in the forest. The villagers have accused the local administration to be negligent of their duties, which have lead to the rise in the untimely deaths of peacocks in the region in the past three years. Reacting to the incident, forest department officials claimed that in the recent times ponds have been constructed, but the region has been facing deficit of rainfall since a few years, which has eventually led to death of these birds. The department has asserted that strict measures would be taken to prevent such situation in the future.